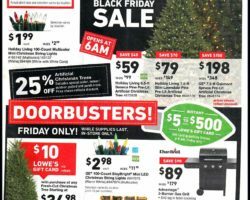 Browse Lowe’s Weekly Ad & Sales. Don’t miss this week Lowe’s Ad sale, digital coupons, current flyer prices, appliances deals, and the latest tools & hardware specials. Lowe’s is a hardware & home improvement store that saves shoppers big bucks on building supplies, all things electrical, flooring, lawn and garden, kitchen and bathroom among others. The retailer sells in stores and online a wide selection of quality merchandise sourced from respectable brands and features big names such as Southwire, Hubbell, GE, Fluke, Raco, Siemens and Wiremold. With installation services for kitchen, bathroom, bedroom, living room, garage & storage, exterior and entire home, Lowe’s makes it easier to shop for all home needs in one place with even accepting special orders. Shoppers can find Special Orders catalogs in each department and upon selecting an item, sales associates will look up a price for it and process the order. An overall affordable store, Lowe’s offers 10% discount to military personnel and veterans online and in store with a MyLowe’s account, provide exclusive online deals every day, sell participating items at up to 40% off regular price and run clearance deals across categories at all times.